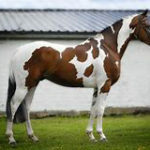 Though the American Paint Horse Association does not define the Paint Horse breed by its coloration, there is no doubt that it has distinct markings. Each horse has a particular combination of white and another color on the equine spectrum. For those interested in coloration terminology, we have included several important terms below. Tobiano— This is the most common spotting pattern. It is characterized by rounded markings, white legs, and white across the back and between the withers and the dock of the tail. 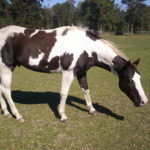 The whiteness is often arranged in a roughly vertical pattern with more white than dark, but the head is general dark with markings like that of a normal horse. Overo— Overo is characterized by sharp, irregular markings with a horizontal orientation. These horses are generally more dark than white, though their faces are generally white. These horses will often have blue eyes. The white rarely crosses the back, and the lower legs are usually dark. 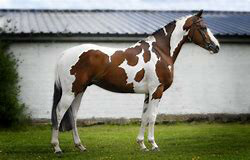 The APHA recognizes three separate overo patterns: Frame, Sabino, and Splashed White. 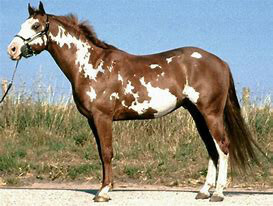 Tovero— This is a spotting pattern that incudes a mix of tobiano and overo coloration. 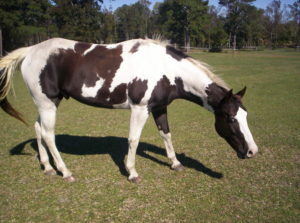 A Tovero Paint Horse may have a combination such as blue eyes on a dark head. 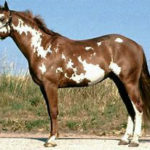 Color patterns differentiate the Paint Horse from other stock-type breeds. Each horse has a unique combination of white and any one of the colors in the equine rainbow: black, bay, brown, chestnut, dun, grulla, sorrel, palomino, gray, or roan.